Have you ever found it hard to figure out what tool you need to manage Windows, sometime it’s an MMC other times you need to go via Control Panel or you need to launch Server Manager? To help with this Microsoft has now released Windows Admin Center so that IT admin can now use a single UI pane to manage the most common admin tasks. This tool is a web-based system that works with either Chrome or Edge (sorry IE). As you can see on the left of the image above there is a wide range of tasks that you can do using this tool, but my most favourite one is the Remote Desktop option that allows you to open a Remote Desktop connection to the server with nothing more than a web browser. The architecture allows this tool be installed on a single Windows Server OS that publishes the management web page. This computer hosting the web site then acts as a proxy for the management task remotely to multiple computers. The good thing about this is that you do not need to install Windows Admin Center on all your computers to be able to management them. 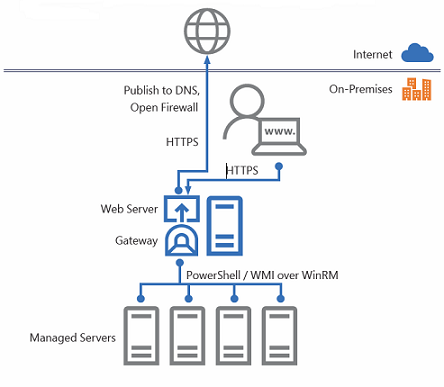 But if you are not running Windows Server 2016 or Windows 10 then you will need to download and install the Windows Management Framework v5.1 ( https://www.microsoft.com/en-us/download/details.aspx?id=54616 ). Another feature of the product is that it integrates with Windows Azure so you can publish you Admin Centre web page online via Azure authentication that allow extra features such as 2FA and conditional access. Once this is done you can have a web page that is accessible anywhere in the world from almost any computer in the world and be able to manage your servers using 2FA authentication. Alternatively, if you just want to check out the product on a isolated Windows 10 computer is “Desktop Mode”. This version only allows you to access the management web page from the local computer running the service. On top of the out of the box feature that Admin Center offers it also excellent support for additional add-on meaning that we are likely to see many other first part and third-party product integrates as well. One example of this is the new Storage Migration Tool that is fully manageable using Admin Center. Also, third parties like DataOn, Fujitsu and Squared Up already have third party integrates in the works or available. Having played with this product for a while now it is great to see that Microsoft is still supporting a first class management experience that can be perform via the UI. While PowerShell is still a important management tool to learn this certainly makes an IT admins life a lot easier by giving them a point and click UI that is easy to use.